Wnts are a class of evolutionarily-conserved, lipid-modified glycoproteins that play a pivotal role in development and homeostasis through a number of different paracrine and autocrine signal-transduction pathways. During early development, Wnt signaling plays a major role in axon guidance, cell polarity, and body axis specification. Extracellular Wnts bind a variety of different receptors, and initiate signaling in several distinct pathways. Receptors include seven-pass transmembrane Frizzleds and receptor tyrosine kinases ROR and Ryk. Wnt signaling pathways can result in changes to gene transcription. 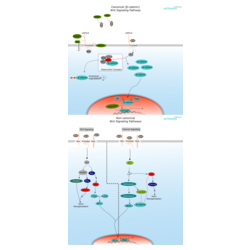 For example, in the canonical β-catenin signaling pathway Wnt signaling prevents destruction of the transcriptional regulator β-catenin. Wnt signaling can also prompt morphological changes to cellular structure e.g., the non-canonical planar cell polarity pathway induces a kinase cascade that results in reorganization of actin, a core component of the cytoskeleton.